Deal Book. 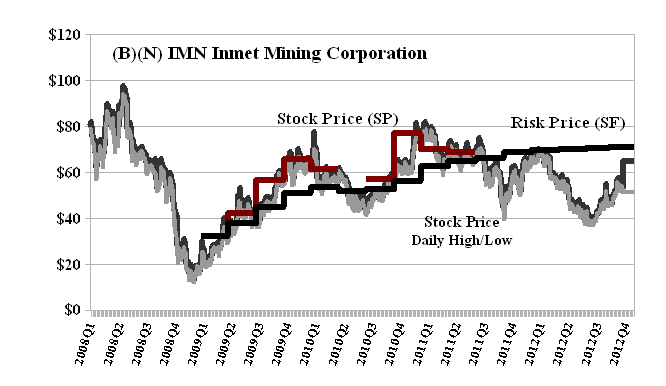 Inmet Mining Corporation has turned down a $70 per share friendly but unsolicited takeover offer from FM First Quantum Minerals Limited (Reuters, November 28, 2012, Inmet turns down First Quantum bid, adopts rights plan). If the offer were in cash (C$4.86 billion) then the shareholders of Inmet would be fairly compensated on a risk-adjusted basis because the Risk Price (SF) is currently also $70 to $71 (please see Exhibit 1 below) and has been steadily rising since $60 to $70 last year (2011) although one might think that the risk price is more likely to go up in the future months as more of its projects and operations are completed or developed absent the ever present possibility of disasters such as mine explosions or flooding, labour unrest or government force majeur. 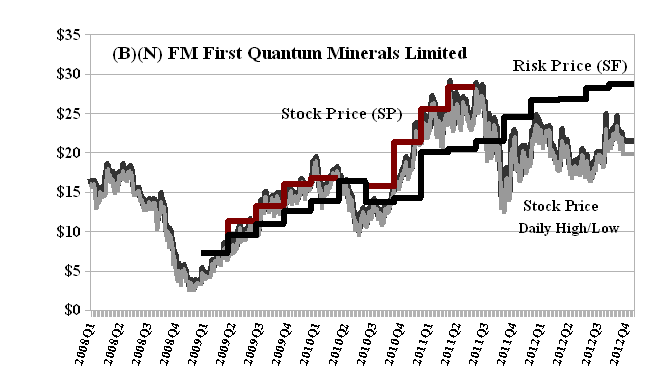 That would certainly be the case if the stock price of First Quantum due to dilution (which is about 25%) and operational and business concerns were to drop by $8 in the next year and that has certainly happened several times before (please see Exhibit 2 in 2010, 2011 and even this year 2012). The protection that could be offered to the Inmet shareholders is (for example) warrants at $8 per new share exercisable before July 2013 (say) and there will be a market for those that is similar to that of put options. For example, the July 2013 put at $21 is currently asked at $3.35 per share but there are no contracts at the present time. In the deal-making scuttlebutt and posturing (please see the news), there’s more hand waving than the Jetta warriors, but it’s really quite simple, isn’t it. We are, indeed, buying risk but – all bounty aside – we also demand the guarantee of capital safety and a hopeful return above the rate of inflation. Please see our Post, The Price of Risk, August 2012, for information. Inmet Mining Corporation is a Canadian-based global mining company that produces base metals with a focus on copper. The Canadian base metal miner is building the massive Cobre Panama copper mine in Central America and has adopted a shareholder rights plan to give it more time to evaluate bids and potentially seek alternatives to a takeover. In addition to its 80 percent stake in Cobre Panama, Inmet owns operating mines in Turkey, Spain and Finland. First Quantum Minerals Limited is a mining and metals company engaged in mineral exploration, development and mining. First Quantum of Vancouver, British Columbia, operates mines in Zambia, Mauritania and Australia and owns mining assets in Africa, Australia, South America and Europe. The RiskWerk Company does not own any of the common stock of either of these two companies and has no financial or fiduciary interest in these transactions.